If by some chance you were under the impression that the thorny issue of the Irish armed struggle / Irish terrorism (delete according to political viewpoint) has only been making its way into mainstream movies in the past thirty years or so then you've missed out on Odd Man Out (1947), one of Third Man director Carol Reed's finest films and what is apparently Roman Polanski's all-time favourite. Taken from a digitally-restored High Definition print, Oscar-winning cinematographer Robert Krasker's (The Third Man, El Cid) imagery has never looked better. Featuring outstanding performances from Robert Newton (Oliver Twist, Obsession) as Lukey, the artist who wants to capture the moment of death in McQueen's eyes, and Kathleen Ryan (Give us this Day, The Sound of Fury), as the woman who loves him more than life itself, Odd Man Out is a story that shows the impact of the Irish Question on ordinary people, and not just those involved directly with the struggle. 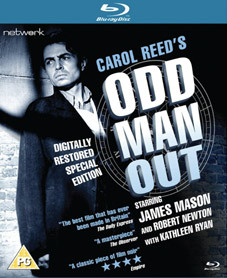 Odd Man Out gets its first ever UK Blu-ray release from Network Releasing on 18th June 2012 at the RRP of £19.99.